An eye catching metallic green colour which just screams Christmas! The varnish was super pigmented and only needed one coat. As a result, it dried very quickly, making the manicure nice and fast. Personally I'd prefer a more girly colour, but there's no denying it's a gorgeous shade so if you're more adventurous with your nails, then this would be a lovely polish to have in your collection. 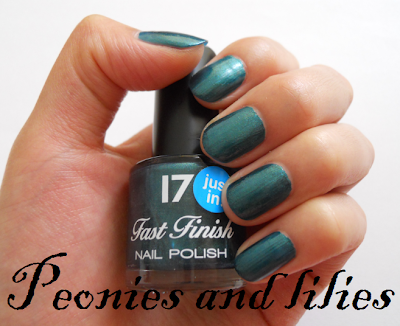 Have you tried any of the 17 nail varnishes? What's your favourite manicure colour? Lookslike its a lovely texture and gives a nice finish. Very pretty! 17 is growing on me! i usually don't like this color but this look georgeous!